Icebox Strawberry Pie made with plenty of ripe strawberries scooped into a flaky pre-baked pie crust, then topped with lightly sweet whipped cream cheese. 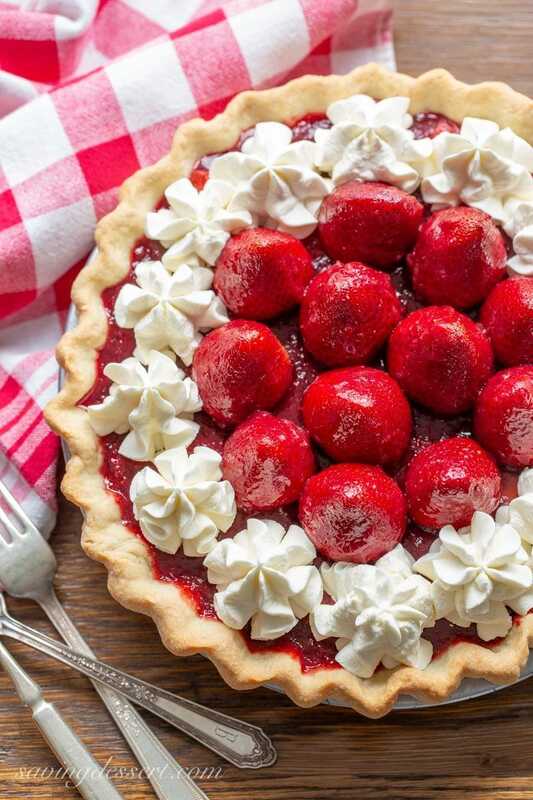 If you love strawberries, then this is the pie for you! Made with minimal ingredients, the flavor of ripe strawberries really shine through. It’s tart and sweet, and a great way to enjoy the season’s best fruit. When it comes to fruit-filled desserts, the quality of the fruit is everything. I’ve said it before, and I’ll keep preaching the message; fresh, ripe, quality seasonal fruits make the best recipes! 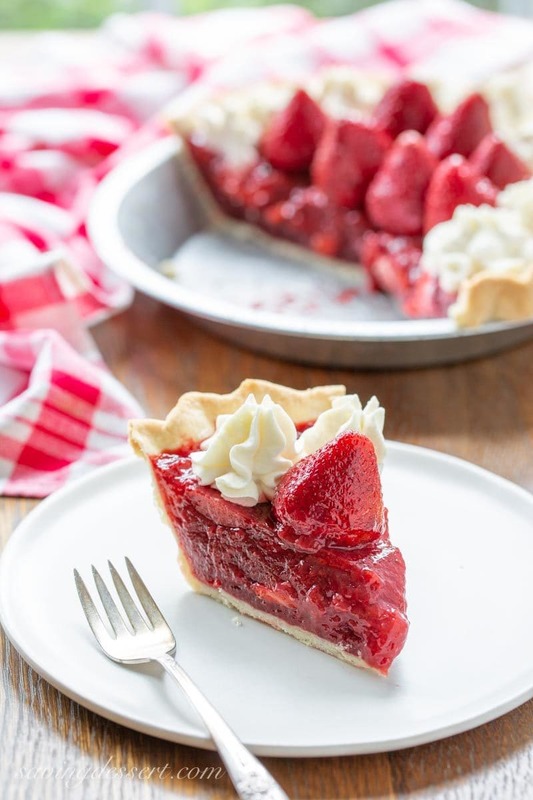 This pie recipe uses strawberries in three ways. Two pounds of frozen strawberries are cooked down to a thick, concentrated filling with a great big berry flavor. Lemon juice is added to brighten the tart-tanginess of the berries, and unflavored gelatin holds the intensely flavored filling together without being bouncy like jell-o pie. 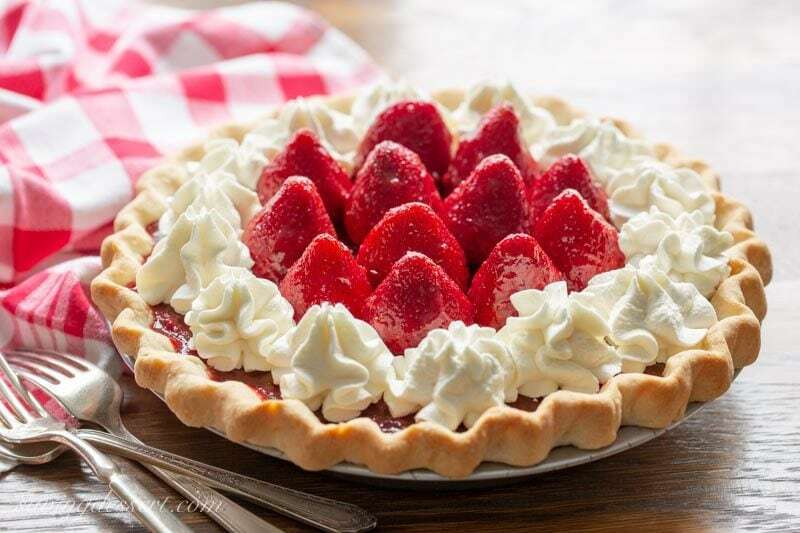 Fresh sliced strawberries are added to the filling for great texture, and once set, the pie is topped with whole fresh berries to give it that ‘all-American diner’ look. The strawberries on top are optional and not really needed for flavor. I just thought the pie looked so pretty with giant whole strawberries on top! Honestly the weight of the whole berries is hard on the filling, so don’t feel bad if you leave them off. The filling is soft, but holds together well without being like set jello. The filling recipe was adapted from a Cook’s Country recipe. When researching this kind of pie I knew I didn’t want to rely with a box of strawberry Jell-O for the base. I wanted the flavor to come from real strawberries which is why I chose this recipe method. The strawberry flavor is the star of this recipe, just like our Strawberry Cheesecake Bars. If you’ve never made a cream cheese whipped cream before, you’re in for a treat. It holds together beautifully and really adds that something extra to this Icebox Strawberry Pie. You can pipe it on top or spoon it over individual slices, it’s all good. The pie needs to stay cool to hold together so don’t leave it in the outdoor heat for long. Let’s be baking friends! If you try our recipe, please leave a comment, and photo if you have one, on Pinterest. If you share on INSTAGRAM use the hashtag #savingroomfordessert so we can stop by and give your post some love. And we’d be so happy if you would FOLLOW Saving Room for Dessert on FACEBOOK | INSTAGRAM| PINTEREST | TWITTER | YOUTUBE for all the latest recipes, videos and updates. 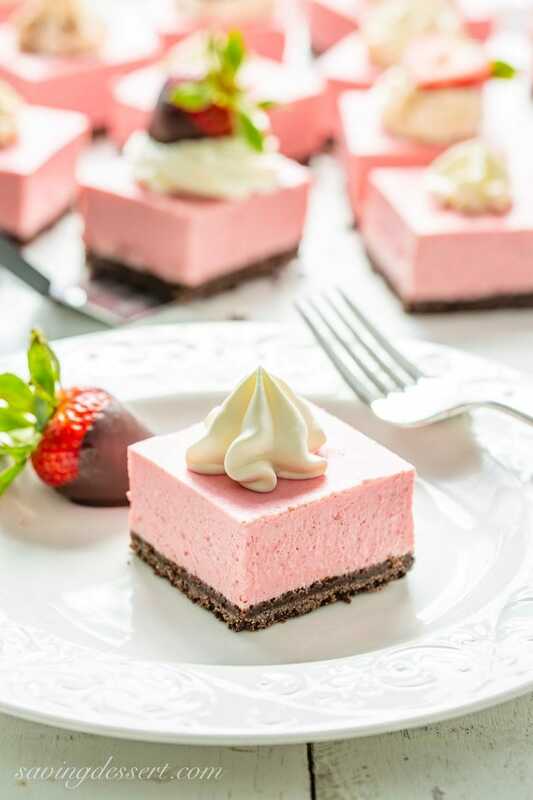 Strawberry Cheesecake Bars – creamy, refreshing, and lightly sweet with an intense strawberry flavor making these deliciously crave-able and perfect for all your summer get-togethers! 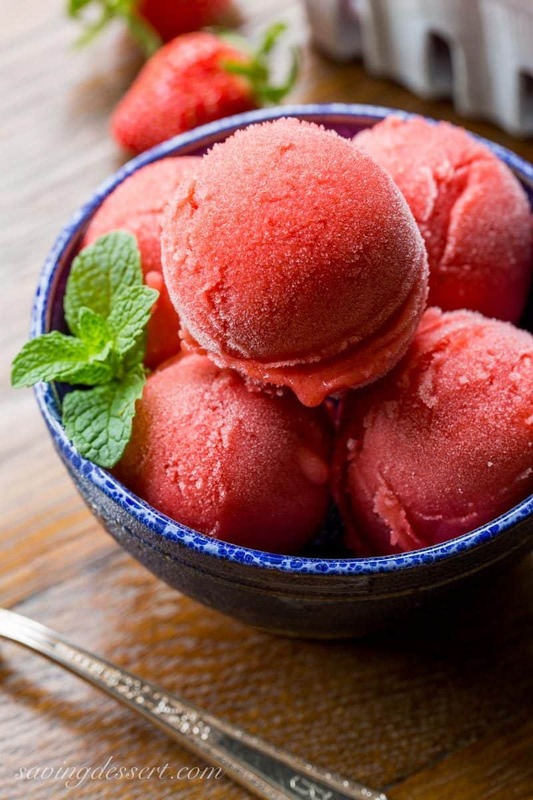 Easy strawberry Sorbet Recipe – a simple, easy and delicious sorbet made with only 3 ingredients right in your blender! The intense strawberry flavor is balanced by a few splashes of Grand Marnier which also helps develop the incredible texture. 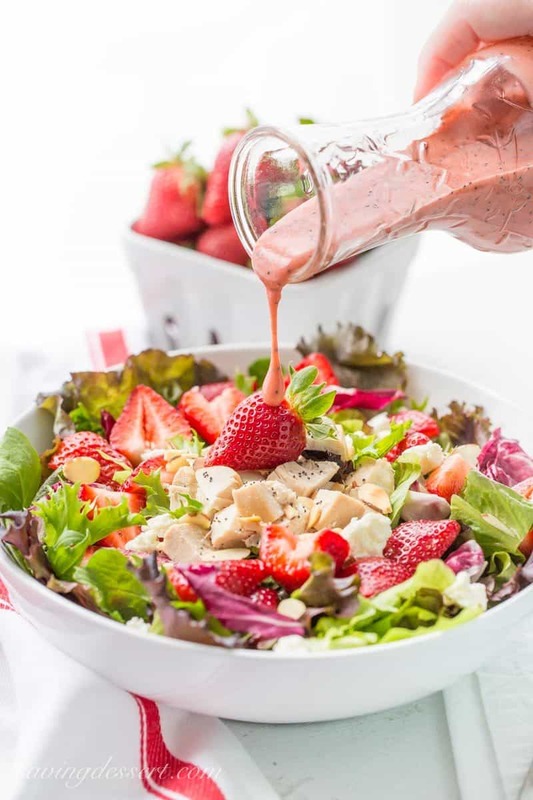 Simple and light, and deliciously refreshing ~ Strawberry Salad with Chicken and Poppy Seed Dressing is a great main course salad with an amazing combination of flavors. From the tender chunks of chicken and the creamy bite of feta cheese, to the toasted sliced almonds and poppy seeds, every bite will delight your senses! Summer icebox pies are the best – here are a few more you might like. Would you believe this Tropical Icebox Pie is grain-free, gluten-free, sugar-free and dairy-free? Sounds like an amazing recipe from Foodie With Family. All you Girl Scout Cookie lovers will flip for this Samoa Ice Box Pie from Melissa’s Southern Style Kitchen. Love this No Bake Peanut Butter Icebox Cake from Crazy for Crust. It looks so creamy and rich – yummy! Here’s one more amazing recipe from The View from Great Island for Icebox Tiramisu – love this flavor combination! Add frozen strawberries to a deep large saucepan. Cook over medium-low until some of the berries start to melt and release some juice, about 3 minutes. Increase the heat to medium-high and cook the strawberries, stirring frequently, until thick and gemlike, about 25 minutes. IMPORTANT: Measure the cooked filling, you should have only 2 cups. If you have more, return the filling to the saucepan and continue cooking until it is reduced to exactly 2 cups. While the filling is cooking down, combine the gelatin, lemon juice and water in a small bowl. Set aside until gelatin is softened and the mixture is thick, about 5-minutes. Add the softened gelatin mixture to the hot reduced strawberry mixture along with the sugar and pinch of salt. Return the berry mixture to a simmer. Cook for 2 minutes, the remove from the heat and transfer hot filling to a clean heat-proof bowl to cool, about 45 minutes. (OPTIONAL) If topping with whole strawberries, place the 12 clean, dry strawberries in a small bowl. Spoon 1/4 cup of the cooked and cooled strawberry mixture over the berries. Toss gently to coat. Remove the whole berries to a plate, flat side-down like they will be on top of the pie. Refrigerate until ready to serve. Return any extra filling back into the remaining mixture. 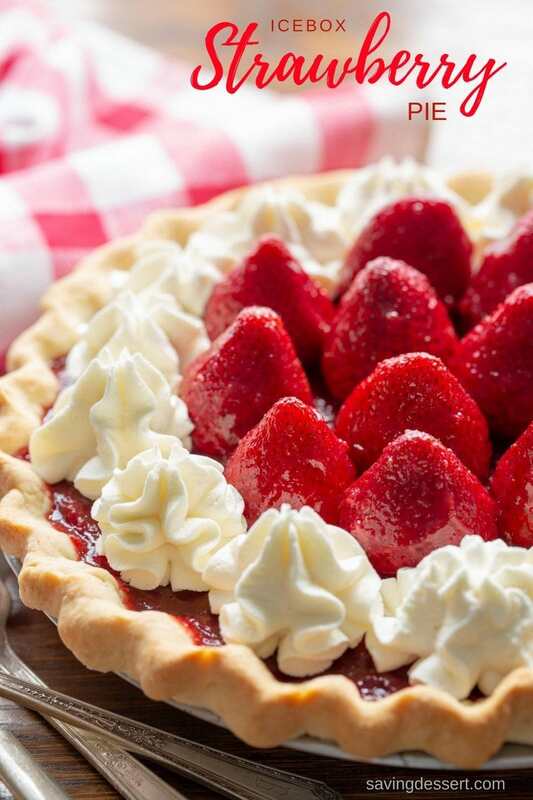 Fold the fresh sliced strawberries into the filling and spread evenly in the prepared pie crust. Refrigerate overnight or up to 24 hours. Add the whole strawberries in a circle in the middle just before serving. Combine the cream cheese, sugar and vanilla in a small bowl. Beat with an electric mixer for about 30 seconds. With the mixer running, add the cream and beat until stiff peaks form, about 2 minutes. Pipe around the outside edge of the pie if desired. Alternatively, double the topping recipe and dollop on top of each slice of pie when serving. This is our favorite ice box pie!! Gorgeous photos Tricia!! Thanks Anna – great to hear from you! I love all the red I’ve been seeing in recipes with strawberries and rhubarb! It’s my favorite season. What a gorgeous pie, Tricia, and you’ve decorated it beautifully! You have put me in the strawberry mood! I can’t decide which I want! SO many delicious strawberry recipes for the season! This pie is perfect for our kitchenless house—Bill will be thrilled to have a homemade dessert instead of Oreos, LOL! Pinning! I love all your strawberry desserts, Tricia, but this one has my name scrawled all over it, love how the glaze makes those berries glisten! Pinning and sharing. Thank you so much Sue – I guess you can tell how much I adore these gorgeous berries! This has no other option but to be tasty! Local strawberries are just starting here, so I’ll be putting this fabulous pie on the menu soon 🙂 Beautiful! 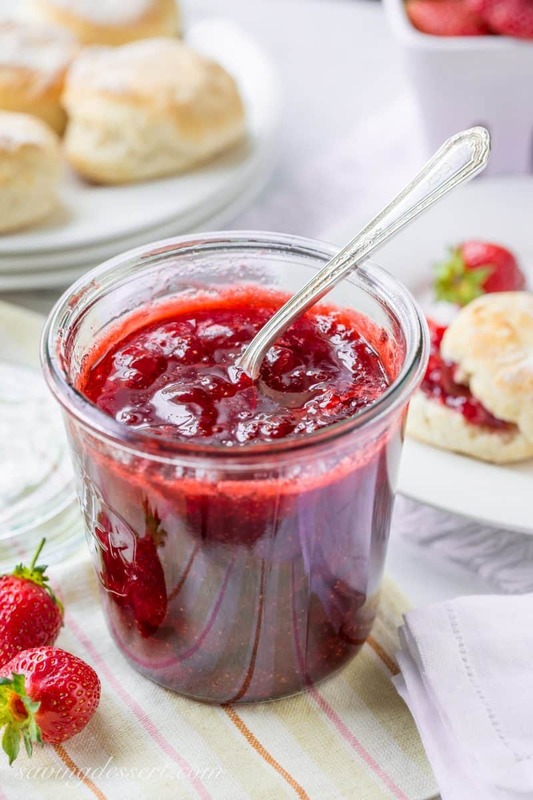 You have the most amazing strawberry recipes on blogsphere! The pie looks stunning, Tricia. Now please pass that slice over, will you? I would love to share with you Angie – come on over 😉 Thank you sweet friend! They all look delicious – you are surely the Strawberry Queen. Thanks Larry – do I get a plaque or something? Maybe a crown – such fun! I really love to bake and cook with fresh fruits. Strawberries are one of my favorites. Thanks so much! 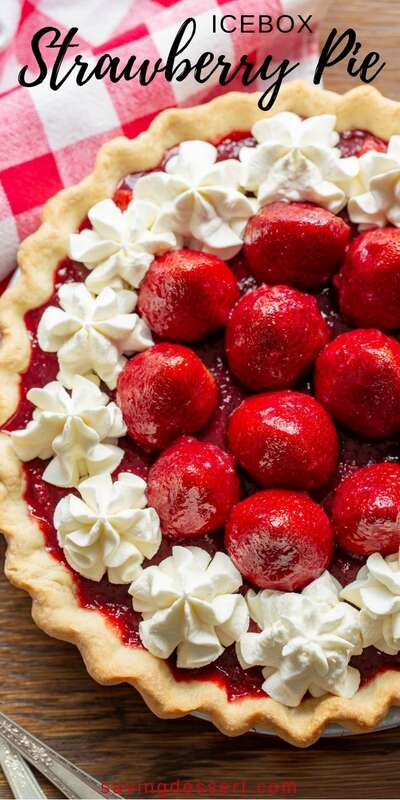 This is a pie-lover and strawberry-lover’s dream come true. It looks so… pretty and so… delicious! I want to a little mouse at your house during strawberry season! Well, actually any time of year, that would be some good eating! Thank you Chris for the kind words 🙂 This is a wonderful pie with so much strawberry flavor. Fun to make too!